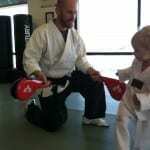 CORE Martial Art’s Peewee Taekwondo Class is offered to children from the ages of 3-5 years. Instruction at these precious young ages is geared towards improving coordination, listening skills and performing basic martial art techniques. The class moves at a fast enough pace to keep even the most energetic youngsters entertained. Our philosophy at CORE Martial Arts is that a true peewee program should focus more on teaching young students how to control their minds and bodies, and less about progressing through belt ranks. All Peewee classes are taught using the most effective teaching methods available for this age group. Peewee classes meet a 8 student maximum attendance per class, in order to learn in the most conducive atmosphere for quality results. Parents must pick their class based on the availability of this student maximum. Please refer to our online schedule for a list of available class times. For more information please call Instructor Justin Lindal at 224-612-3665.